A sort of Ambien/No-Doz cocktail likely to send all but fanboy brains into self-protective shutoff mode. 145 min. Paramount Pictures. Director: Michael Bay. Cast: Shia LaBeouf, Tyrese Gibson, Josh Duhamel, Anthony Anderson, Megan Fox. Schoolboys, get the lead out. Hollywood has spent massive amounts of money to make you a movie about hot cars and sweet babes. It's Transformers, of course, Michael Bay's sweaty action comedy about twisting steel. Based on the Hasbro toy line (and tie-in animated TV series), Transformers depicts the intergalactic war between the Autobots and the Decepticons, waged of late on planet Earth. These alien robots hide out in various mechanical guises, including the used Camaro of unsuspecting teen dork Sam Witwicky (Shia La Beouf, doing his best teen-dork shtick). The first-car rite-of-passage represents a highway to babes, specifically smokin'-hot Mikaela (Megan Fox). Tired of her thick-necked, presumptive boyfriend, Mikaela accepts a ride with Sam; they both get more than they bargained for when the independent-minded "Satan's Camaro" turns out to be an alien robot dubbed Bumblebee. The endurance test that follows plays like a cross of E.T., Godzilla (1998), and a demolition derby. There's a farcical scene—one that disproves the robots' supposed super-intelligence, but never mind—in which Sam must hide the giant robots from his parents (Kevin Dunn and recent Tony winner Julie White, earning their paychecks). Wait—aren't Transformers all about the hiding? Never mind. One of the Decepticons replaces "to protect and serve" on his police-car disguise with "to punish and enslave," demonstrating a reckless sense of humor otherwise inevident in the nasty robots. The Autobots, at least, learned colloquial English (and Ebonics--don't ask) from the World Wide Web. In this way, the robot heroes can exude campy personality in brief scenes requiring them to...well, exude personality. The screenplay credit for Roberto Orci & Alex Kurtzman (Mission: Impossible III) seems strictly a technicality: someone had to stitch together the film's nonsense in something approaching coherence and interest. Nevertheless, Transformers has more than its share of lazy plotting, illogic, and head-scratching style moves (a shot of Jon Voight emerging from a helicopter inexplicably shot in slo-mo, for example). That's right, as in previous Bay efforts, a couple of respected character actors have been bought. This time, it's Voight as the Secretary of Defense and John Turturro as a military man "peed on" by a Transformer (there's a spot-on metaphor for his career choice). Art versus commerce used to be a fair fight, but now the films themselves are giant product placements; aside from Transformers toys, games, and T-shirts, figure in brand-name vehicles, sodas, and a variety of hardware. Speaking of fights, the 145-minute Transformers is built for brawling, and highly skillful CGI work from ILM is practically the only relief in a sea of tastelessness. There's an undeniable wow factor for the children of video games, but those with a low tolerance for noisy stupidity are advised to run in an opposite direction. Bay shoots and edits in his customary vertiginous, epileptic style, which makes the film a sort of Ambien/No-Doz cocktail likely to send all but fanboy brains into self-protective shutoff mode. I'll leave the evaluations of the film's faithfulness to the source material to those same fanboys. (I know this much: original voice-over artist Peter Cullen voices Optimus Prime, and Sam tells Mikaela, "I think there's more than meets the eye with you." Cue laughter and applause.) My biggest laugh came in the film's 145th minute, when the credits read, "The characters and events depicted in this photoplay are fictitious..." Accompanying what may be the most ludicrous premise since Plan 9 From Outer Space, that credit earns a resounding "Duh." I can't be as agreeable when it comes to the one line of dialogue most certainly scripted by Bay: "This is easily a hundred times cooler than Armageddon." Armageddon was junk, but it made nominally more sense, had more good actors, and was a lot less boring than Bay's latest. Ironically, Transformers is a highly personal film, concerned as it is with military might, testosterone-fueled play, chasing tail, and having the loudest engine on the block. The director's egomaniacal approach to directing comes out in every bombastic frame. Bay's not the witty scrapper Sam (family motto: "No sacrifice, no victory"); Bay's the blockheaded jock who harrasses Sam, ridicules his ride, and bogarts the hot girl. 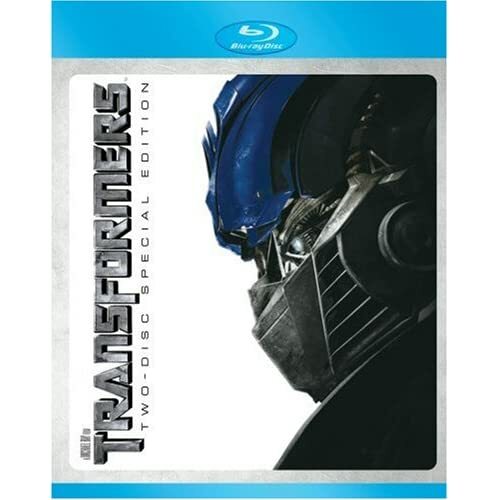 Though Transformers obviously didn't rock my world on its release to theatres, my vitriol mellowed a bit when I popped in Paramount's very impressive 2-disc Blu-ray special edition (mirrored for the most part on DVD). Bay's film seems more harmless for those seeking dumb fun, and ILM's effects work seems all the more dazzling, especially in the shiny high-definition of Blu-ray. Certainly, the film has many more fans than detractors, and those fans will go gaga over this SE's thorough support of one of 2007's biggest movies. The video transfer is great. The only flaw in the image is one that seems endemic to the original film: frequently unnatural flesh tones and occasionally blown-out contrast. To my memory, these accurately represent extreme but deliberate visual choices by Bay, as seen in theaters. An awesome surround mix, presented on Blu-Ray in lossless audio, preserves every discrete effect and metal-crunching wallop. Disc one offers a feature-length commentary track with director Michael Bay. Bay discusseshow he came on board the project, tone (edgy-funny being his "thing"), casting, working with Hasbro and the military, fan reaction and failed efforts at secrecy, and effects and how he has "raised the bar." Bay fans and Bay detractors may find the track equally interesting. Transformers H.U.D. improves upon the increasingly common picture-in-picture "video commentary" by spackling in many of the gaps with pop-up trivia. You'll see footage of the scenes being shot, animatics, the actors recording the Transformers' voices, and factoids such as tech specs, connections to the Transformers toy lines and series, and actor trivia. Numerous interview clips also give body to the track, with comments from Bay, Steven Spielberg, Shia La Beouf, Megan Fox, Rachael Taylor, Anthony Anderson, Kevin Dunn, W. Morgan Sheppard, and representatives of the behind-the-scenes staff and military. You can also enjoy the irony of this insight: "One of the aspects that Michael Bay wanted in his version of Transformers was realism, so there is no mass shifting with the transformations." The Blu-ray is also BD-Live compatible, so if you have an internet hook-up, you'll be able to watch the film in Intelligence Center mode (with "dynamic robot facts, health status and a GPS locator) and share your favorite scenes with the MyClips bookmarking feature. Disc two houses the documentaries (all presented in HD), starting with four-parter "Our World" (49:14). "The Story Sparks" (8:32) looks at the evolution of the film from the franchise's legacy in toy stores, on TV, and in comics, and how fearless leader Bay made it all work. "Human Allies" (13:09) delves into the talents surrounding Bay, while "I Fight Giant Robots" (13:58) focuses on the actors' military training and the shooting of the big-scale action. "Battleground" (13:33) goes into further detail about the shoot, location work, the large-scale sets, and stunts. Fresh interview participants include executive producer Brian Goldner, writers Alex Kurtzman and Robert Orci, Jon Voight, Josh Duhamel, John Turturro, Tyrese Gibson, and many more amongst the cast and crew. Hasbro and military advisors are also well represented here. The five-part "Their War" (1:05:10) further details the Transformers' legacy. "Rise of the Robots" (13:39) is a fan-centered look at the toys' popularity (including footage from Botcon 2007...whoa) and the film's attempts to appease the fans. This one includes Goldner's priceless comment "About 75% of all adult men have had a major Transformers experience in their lives." "Autobots Roll Out" (19:59) and "Decepticons Strike" (14:32) explain the specific choices of character inclusion and design. "Inside the Allspark" (16:59) introduces us to the talents at Digital Domain and ILM who created the special effects. A related bonus is the Transformers Tech Inspector, which provides 360° rotating views of Optimus Prime, Ironhide, Bumblebee, Megatron, Blackout, and Starscream. Pretty sweet. The More Than Meets the Eye section includes "From Script to Sand: The Skorponok Desert Attack" (8:52), a breakdown of the action scene looking at design, animatics, 3-D animation, location scouting, practical special effects, and digital effects. "Concepts" (2:09) shows off conceptual art. We also get the film's Teaser Trailer (1:49) and two Theatrical Trailers (2:11, 2:34). Alert consumers will also uncover at least four Easter Eggs, including a further look at Bay's cameo, a fake Bay Transformers toy ad, a brief look at "Casting Mojo," and the rigging and shooting of a tearaway dress, including the final shot deleted from the film. This is a truly spectacular special edition for home video, especially in the packed and glossy Blu-ray version. All site content © 2000-2019 Peter Canavese. Page generated at 04/19/2019 11:33:25AM.